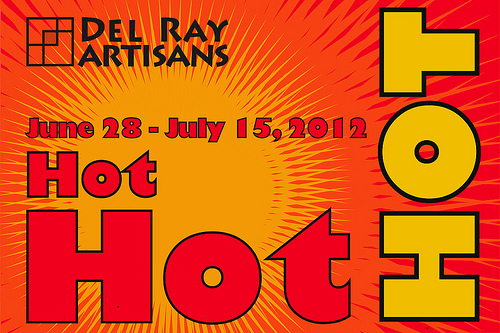 On Sunday with Ken we visited Del Ray Gallery in Alexandria, Virginia, to see their new exhibit “Hot! Hot! Hot“. The exhibit opened on June 28 and will be open until July 15. On Friday, July 6, from 7 to 10 P.M., the Gallery will have an art reception for the show with cool snacks and live music. If you are in the area, I definitely recommend to come and visit the show. Artisans were given a chance for a free interpretation of the exhibit theme. So, they did! 🙂 The variety of works and media in which they are done is very wide – paintings, mosaics, jewelry, mixed media, photography, installations, and small sculpture. 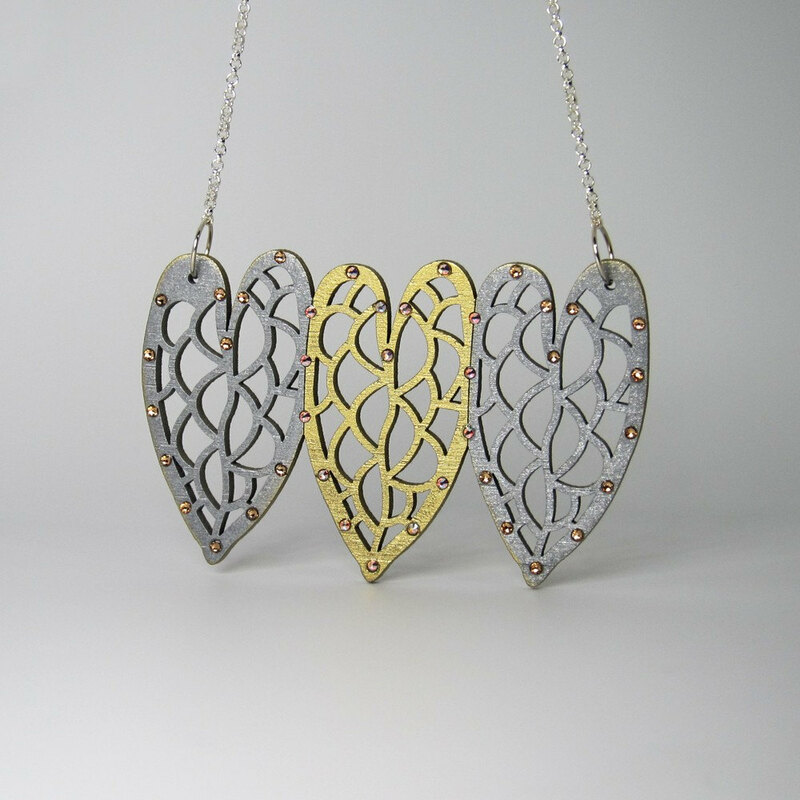 Some items are created from new, some – from recycled and reclaimed materials. But they definitely all are hot! 🙂 Prevailing colors are obviously red, orange, and yellow and prevailing themes – sun, fire, spice, and free stream of energy. 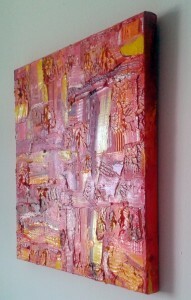 My friend Susan Hicks has her work “I’m Burning” (painted with palette knife and oil) displayed at the exhibit. You can see pictures of her work here, in this post. 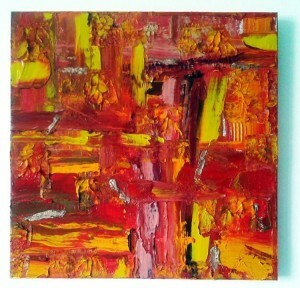 I love the deep juicy colors of it and even more – the wonderful texture. Now, we all love texture, don’t we? 🙂 Congratulations, Susan, on being juried into the show! 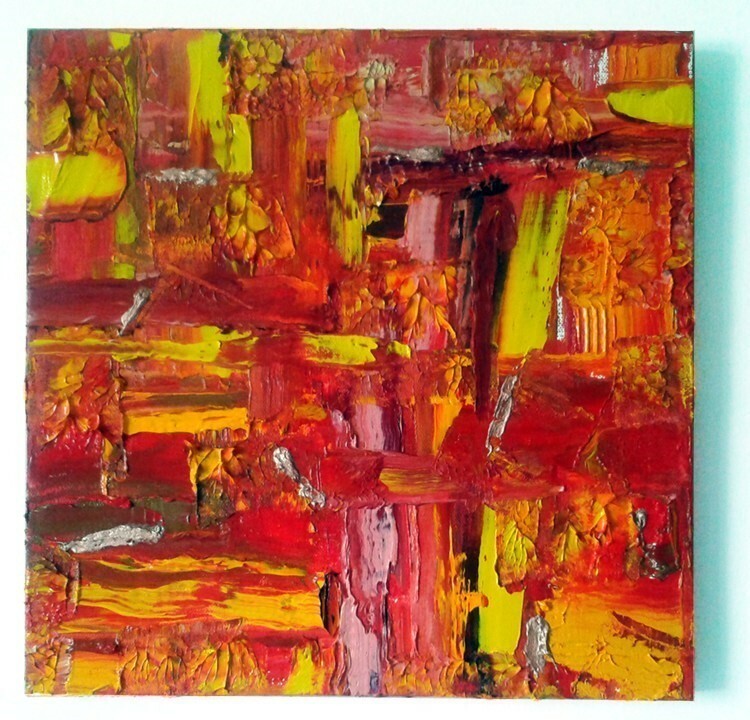 I would like to demonstrate for you more pictures of the work exhibited at the show, but unfortunately I cannot do it, as the Gallery does not have works presented in digital format. For my part, I obviously could not walk into the Gallery and start snapping pictures :). So, the only way to see all this beauty is to come and visit! 🙂 Admission is free, although you’re more than welcome to donate something (I did :)). In addition, the artwork at the show is priced very reasonably (prices range from 50 to a few hundred dollars), so if you were thinking about adding a piece of original art to your collection, here’s your chance to do it! If you did (or will) visit the show, please, share your thoughts and impressions with me in the comments below. Thanks for the nod! Everyone – do come see the show. It’s a feast for the eyes. You’re welcome, Susan! Agree about the feast :).